AMIGOS DEL SOL SPANISH SCHOOL, Oaxaca, Mexico! 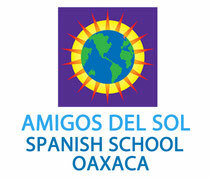 Amigos del Sol is a small Spanish Language School located in Oaxaca, Mexico. It was founded in 1998 by Rogelio Ballesteros Castro. Our main goal is to provide personalized instruction in the Spanish language to students from all over the world. We offer small group lessons limited to three students at the same Spanish Level, as well as one-on-one lessons tailored to the individual student´s needs and goals. Most of our teachers have been working at Amigos del Sol for more than 10 years. They have a wide range of experience teaching Spanish language learners at all levels. They love teaching, and they adapt their methods to best serve the goals of each student. Our teachers are native speakers, are enthusiastic and patient professionals. Through the years and based on our teaching experience, we have developed a method and materials to help students learn Spanish in an easy and fun way. From 9:30 a.m. to 12:30 p.m., students talk most of the time. Grammar is presented through conversation. There is a grammar session from 12:30 p.m. to 1 p.m. to reinforce what students have learned. We love teaching Spanish, and we would be very happy to have you at Amigos del Sol. New Zealand, Austria, Israel, England, Switzerland, Japan, Germany, Netherlands, Australia, Canada, France, USA, Sweden, Denmark, Belgium, China, Norway, Thailand, Philippines, Hungary, Italy, Turkey and Finland.